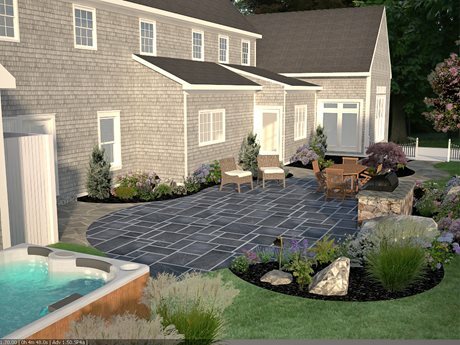 Christopher Jeffcote, with Captain’s Landscape Design & Build, recently had the opportunity to design a new outdoor living space for this quaint seaside home. The property had an existing patio that didn’t get much use. Read on for Christopher’s explanation of how he redesigned the patio to better serve the homeowners. Property size: 1 acre, patio 800 sq. ft.
“The existing patio provided a reasonable footprint for the family to enjoy time outdoors; however the space was poorly designed, bland, and generally unappealing,” says Christopher. Ultimately, this patio was being used as a transitional walkway from the side door to the fenced in pool, when it should have been a place to relax with family and host company. “The main flaw of the existing patio is an all too common mistake. 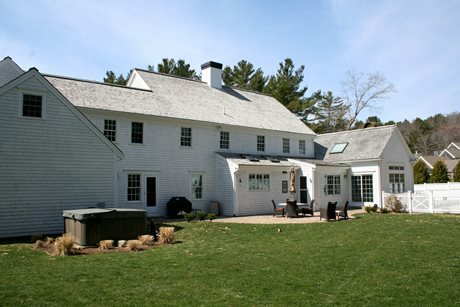 The patio not only followed but was carried to the foundation of the house,” explains Christopher. This is a problem for two major reasons. First, the area directly against a home’s foundation is one of the hardest areas for contractors to achieve an adequately compacted base for setting concrete pavers on. “This area is also prone to water runoff from the roof. Between the water issues and compaction challenges, this area will always be prone to sinking and un-level patio surfaces,” he continues. Secondly, the area directly against the foundation does not easily allow foot traffic. “Unless you or your guests are rubbing against the shingles of the house as you walk, the first foot off the foundation is a waste of material, money, and space,” Christopher concludes. “My approach for this design was to give this large family a space where they could enjoy time outdoors without feeling the need to migrate to the pool patio every time there was to be an outdoor event. I decided to generously pull the new patio away from the house and further into the yard,” he explains. Pulling the patio away from the house forced longer walkways to access the patio. I chose to use a different material from the main patio, which was a natural cleft pattern bluestone, and used an irregular bluestone for these four walkways. To designate this space as an outdoor dining, entertaining, and relaxing area Christopher proposed a stone sitting-wall or built in grill island. The homeowners opted for the sitting-wall. He also created large planting beds around the outer perimeter of the patio to slightly enclose the space and capture the ‘secret garden feel’. 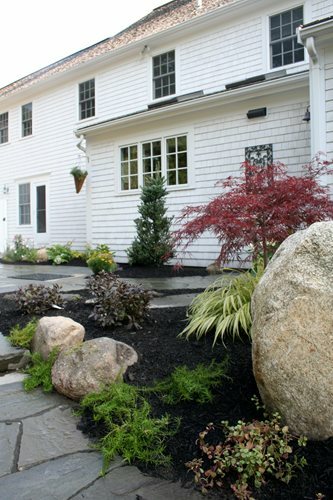 “The spaces between the new walkways created planting beds where I introduced large boulders. Strategically positioned, these large boulders create an organic feel that complements the natural setting,” Christopher recalls. In the beds he also added low-maintenance plant materials that are staples in any New England landscape, such as Dwarf Weeping Japanese Maple, Hydrangea, Ornamental Grasses, and Coneflowers. 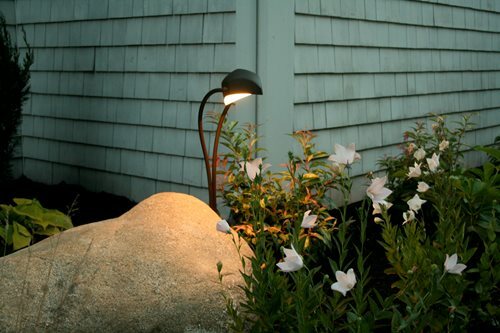 In time, various low-growing perennials, including Japanese Blood Grass, Creeping phlox, and Coreopsis, will grow around the base of the boulders and create a flawless look. 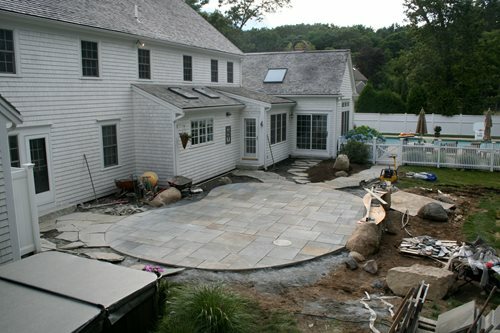 The main patio flooring is a full-color natural cleft bluestone in random pattern, a strong and durable stone that is 2” thick and will easily stand up to New England winters. An antique granite millwheel was inlaid in the patio that designates the cover of the septic cleanout. It was necessary to build a portion of the patio over the septic distribution box to achieve the design. To add an extra element of functionality to the space, Christopher used Kichler landscape lighting to illuminate the patio space at night. Path and accents lights were used to subtle add lighting where necessary. 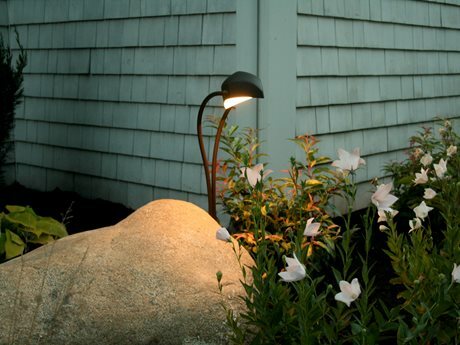 “Although floodlights and security lights serve a purpose, they do not provide the correct ambiance for enjoying the outdoors,” says Christopher. “The end result is a simple yet well thought out patio that provides a unique space for the family to relax and entertain guests. 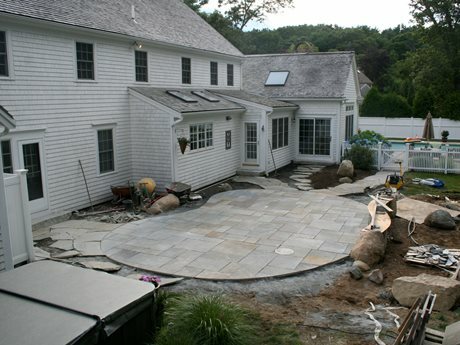 Sadly, the patio that we replaced was comparable in cost to the new bluestone patio I’ve built.” Homeowners often skip the design phase of landscaping which results in a patchwork of ideas and thoughts and can amount to a space that doesn’t function properly (as was the case with the original paver patio). Christopher cautions against spending thousands of dollars on landscape construction without investing in a design first. 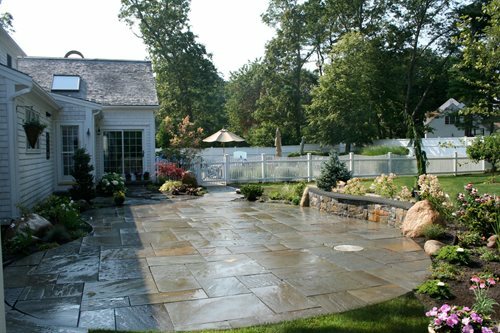 “A well thought out patio design will always maximize your investment, regardless of your budget,” he says.